International Roma Day is on 8th April every year. It’s a day to celebrate Roma culture and raise awareness of issues facing Roma people. Hitler named Romani people ‘enemies of the race based state’, and historians estimate that between 220,000 and 500,000 Romani were killed by the Nazis during the Second World War, between 25% to over 50% of the 1 million or so Roma in Europe at the time. Roma people still face persecution across the world today, in particular far right protests in Italy make it all the more important to stand together as a community. 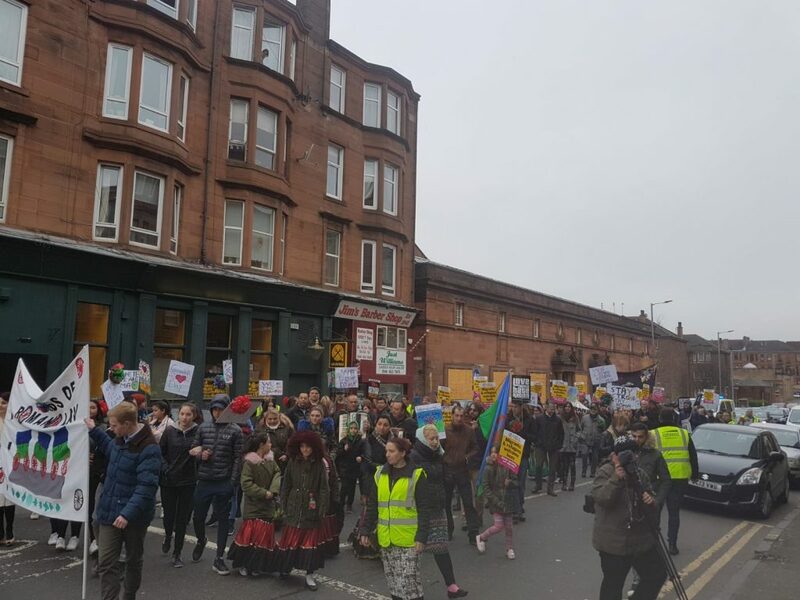 Govanhill’s International Roma Day celebrations took place on Saturday 6th March, organised by Romano Lav. There were inspiring speeches and a procession through the streets of Govanhill with accompanying music. Afterwards, there was a community meal with traditional Roma food, followed by a performance of ‘The Acrobat’. This play is a celebration of the extraordinary life of Raymond Gurême, a French Manouche (Roma) man who escaped nine times from internment camps during the Second World War.